Standard shipping rates apply for orders shipped to the 48 contiguous US states (Additional charges apply for orders shipped to Hawaii and Alaska). For expedited orders to Alaska or Hawaii and all orders shipped to Puerto Rico or islands off the US (i.e. Martha's Vineyard, Kiawah Island, etc. ), APO/FPO addresses and international locations, please call 914.345.9463 for current rates. Sorry, we cannot ship items to a P.O. box. For UPS 2-Day Air or Next Day Air orders greater than $250, you can also call us at 800.356.8466 for alternative rates. Saturday delivery not valid on UPS 2-Day Air Delivery. Please select Next Day for Saturday delivery. gift registry for the modern couple. Only 15 left in stock - Order today! 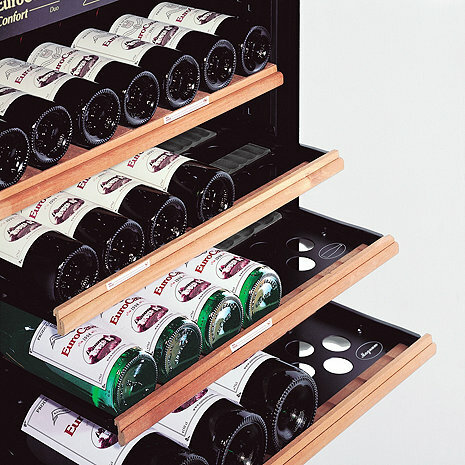 An ingenious system that makes it easy to sort and find bottles in your wine cellar. Label the shelves of your EuroCave wine cellar with these precision cut and ruled shelf tags. An ingenious system that makes it easy to sort and find bottles in your wine cellar. Label the shelves of your EuroCave wine cellar with these precision cut and ruled shelf tags. The labels are resin coated for durability and allows for you to write with any pencil, pen or marker. There's a pre-ruled line for the wine name and for the vintage. Comes in a pack of 25. Tags do say EuroCave on them and are only available that way. They are designed to sit in the lip on the front of any EuroCave shelf. This item ships via Standard Shipping and is eligible for Express Shipping. Click Here For Shipping Rates. All 2-Day and Next Day Air orders placed before 1pm ET weekdays will be shipped same day. Orders placed after 1pm ET or weekends will be shipped next business day. Standard shipping rates apply for orders shipped to the contiguous 48 US states. For orders to Alaska, Hawaii, Puerto Rico, APO/FPO, or islands off the US (i.e. Martha's Vineyard, Kiawah Island, etc.) addresses please call 914.345.9463 for current rates. Sorry, we cannot ship items to a P.O. box. The tags have to be cut yourself and are nothing more than a simple sheet of paper with lines. Bought Premier EuroCave at the same time, but didn't realize it included tags. Would not have purchased tags if I knew this. [...] Would not have bought tags if I hadn't thought the tags would just ship with the EuroCave. not much substance. A small piece of paper, no adhesive. Order this item today to reserve one risk-free. Currently, the estimated time of arrival is unknown. We are waiting for our supplier to provide us with an expected ship date. We will update our ship date with an actual date as soon as we have accurate information from our supplier. You may cancel an order at any time prior to shipment, at no additional cost, by calling 800.648.6058, or by sending an email to custserv@WineEnthusiast.net. *Although we do authorize your credit card for available funds upon purchase, the authorization falls off within a matter of days. Rest assured your credit card is not actually charged until your order is shipped. © 2019 Wine Enthusiast Companies. All Rights Reserved. Free Standard Shipping on single merchandise orders of $99 or more excluding taxes. Excludes select large and/or heavy items to which additional shipping charges apply. Excludes select personalized items, custom racking, cooling units and select items shipped directly from the manufacturer. Charges may apply for special shipping circumstances. Check the product's detail page or call 800.356.8466 for specific information. Offer not valid on 1-day or 2-day delivery. Applies only to single-address shipments to the contiguous 48 United States. Not combinable with other offers and cannot be applied to previous purchases. Promotion does not apply to WineExpress.com. Please fill out the following form so we may better serve you. * We will not use your email address for marketing purposes. Have A Question? We Want To Hear From You! Prefer to contact us by phone? You can call us anytime at 800.356.8466.